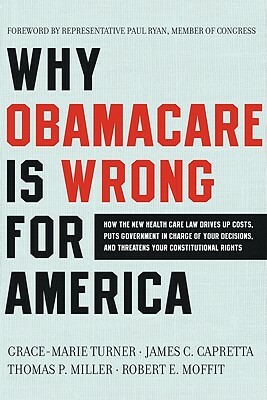 Why ObamaCare is Wrong for America is the first in-depth examination of the impact of the new national health care law on American individuals, families, and businesses. Written by an esteemed quartet of experts and former health policy officials, Why ObamaCare is Wrong for America demystifies the convoluted plan that the Obama administration and a Democratic Congress pushed through, exploring its effect on real people. Eye-opening and important, it is a book that everyone in America should read—providing essential information on what’s in the new Health Care Law, how it will affect YOU, and what you can do about it. Grace-Marie Turner is the president of the Galen Institute, a public policy research organization she founded in 1995 to promote an informed debate over free-market ideas for health care reform. James C. Capretta is a Fellow at the Ethics and Public Policy Center (EPPC) and Project Director of ObamaCareWatch.org, was an associate director at the White House Office of Management and Budget (OMB) from 2001 to 2004, where he was the top budget official for health care, Social Security, education, and welfare programs. Thomas P. Miller, Esq., is a resident fellow at the American Enterprise Institute, where he focuses on health care policy, with particular emphasis on such issues as information transparency, health insurance regulation, and consumer-driven health care. Robert E. Moffit, Ph.D., a seasoned veteran of more than three decades in Washington policy making, is a senior fellow at The Heritage Foundation’s Center for Policy Innovation. This timely and lucid book is the thinking person’s answer to two questions: Why is this fight crucial to Americans’ health and America’s civic health? And how can it be won? A vital contribution to the ongoing national debate over ObamaCare. What sets this work apart is that it not only exposes the flaws of the new law, but also points the way toward true free enterprise-oriented reforms. ObamaCare can be -- indeed must be -- ‘repealed and replaced.’ This invaluable book provides the arguments to win the public debate and replace ObamaCare with a genuine reform that truly delivers world-class health care at a cost we can afford. This succinct and lucid summary of the horrors of ObamaCare and what we the people can do about them will be an essential handbook in saving us from medical socialism and bringing true free markets to health care -- which, in turn, will generate more health care at less cost! At a time when core American principles are threatened on every level, this book will arm you with the knowledge, facts, and insight on what YOU can do to help repeal this bill.